Words can be treacherous. They can have an effect that goes beyond their original meaning or intent. The terminology used during the current global financial crisis is particularly important because of the role some terms can play in reshaping and molding public opinion. Here are several headlines that appeared in major world publications over the last month: 1929 and All That: Echoes of the Depression, Financial Meltdown Creates Panic, Is the Sun Setting on U.S. Economic Supremacy? …and perhaps the most disturbing: Financial Crisis to Increase Mental Illness. 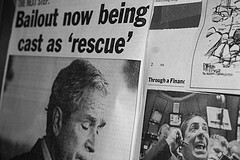 Media outlets often bombard us with words like turmoil, disaster, recession, crisis, wreck, chaos, panic, and depression. This can shake the economic lethargy off even the most disinterested person. One study even compiles a chart of the word depression mentioned in the media, depicting a record increase in 2008. The effect is certainly depressing. In fact, the field of economics, often refered to as “the dismal science”, has adopted a peculiar language which often is characterized as dogmatic, alienating, and even ominous. One phrase from investors’ jargon provides an especially unsettling image: dead cat bounce. The term refers to a stock experiencing a rapid decline: like a dead cat thrown off a building, it will purportedly bounce, rising in price before a complete collapse. It is unclear whether other cultures have adopted a similar animal-unfriendly version for a badly-performing stock. Germans are the only other nation, to my knowledge, which found the cat analogy useful — Hüpfer der toten Katzen! say frustrated German investors. In the U.S., the controversial government strategy to ameliorate the crackdown of national financial system also raises a question about underlying terminology: is the proposed action a bailout or is it a rescue? The difference is not trivial. A financial rescue sounds less catastrophic than a bailout. The word bailout has a more negative connotation, eliciting an image of a failed parent bailing out a teenager in trouble. Another example is the word Crisis, used profusely and indiscriminately. Some analysts and commentators argue that downturn should be used instead. Since many economists agree that lack of consumer confidence is the driving engine behind the economic deterioration, evoking a sense of helplessness and hopelessness from the public conjures even less confidence, and Crisis becomes a self-fulfilling prophecy. In Russia, which has also been severely affected by the global economic decline, the word default has resurfaced after almost 10 years. For many Russians, this term — adopted directly from English — brings back very unpleasant memories of the 1998 currency collapse. Default reminds them not of the distant 1930s but of a recent and real experience. The result is run-on-banks and widespread fear that history can repeat itself. Language is not neutral. It always carries cultural baggage, and has great influence over the way we perceive and react to events. While economists and financial specialists argue about the correct terminology to characterize the present market environment, members of the media walk a thin line of influencing the public’s perception of economic reality. Linguists, translators, and other language professionals have an opportunity to keep people informed, lest terms like default, bailout, crisis, and dead cat bounce influence the development of real depression, in every sense of the word.